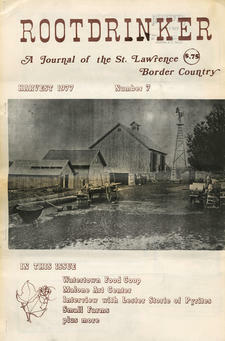 The Rootdrinker is a journal with a bio-regional and environmental outlook with a focus on the St. Lawrence Border Country. "Local News as if People Mattered" was one tag line. It covered the great protests against 765KV powerlines and nuclear power plants on the St. Lawrence River, a battle that involved many of the region's homesteaders. Rootdrinker was way ahead of the curve on food and farm policy and included a number of visionary articles on the future of food.